Everyone ‘loves’ the idea of wind and solar power, until they’re sweltering in the dark. 200,000 Victorian homes and businesses left powerless – after a sudden and dramatic wind power output collapse on 25 January – have got a taste of what wind ‘powered’ South Australians have been putting up with for years. And they don’t like it. Above is the wind power output in Victoria (up there with SA as an Australian RE ‘hero’) on 25 January – for 200,000 Victorians aka ‘Black(out) Friday’ – courtesy of Aneroid Energy. In this post, we covered the fact that Victorian wind power output struggled to produce 20% of its nameplate capacity, while hundreds of thousands of households and businesses struggled to survive without refrigeration, air-conditioning, or any of those other creature comforts one expects in a (notionally) first world country. One seasoned Melburnian, Judith Sloan recounts what it’s like to do without electricity on a stinking hot summer’s day in her home town. I really like the warm weather and I expect some very hot days at this time of the year. But we are prepared: we close up the house early, shut the windows, close the blinds and curtains. We’re lucky to have airconditioning but I don’t really like it, so we use it sparingly. Last Friday, the temperature was expected to soar above 42C in Melbourne. Mid-morning I got in the car to catch up with a pal for coffee. It was already very hot. I was listening to the radio and was assured by Victoria’s Energy Minister Lily D’Ambrosio that “blackouts are something that will absolutely not be a feature of today, or a possibility”. She went on to remark that “what the market operator’s done is put in place … their proper planning to ensure that they have sufficient reserves in place to be able to meet these types of situations”. Having observed the missteps of this minister and her general incompetence, I should have known that Melburnians were in trouble. By the time I was driving home, a series of rolling brownouts (a cute term for electricity being cut off in whole suburbs) was under way. The chief executive of the Australian Energy Market Operator, Audrey Zibelman, was cheerfully informing us that cutting back 100 megawatts involved about 30,000 households losing power. She didn’t seem particularly concern­ed because there was a possibility that a cold front might hit Melbourne a bit earlier than forecast. Mind you, it was not just households that lost power. All those small businesses without power were effectively forced to close. And many food outlets simply had to throw out rapidly spoiling foodstuff. Presumably, some staff members lost pay. But according to Greens leader Richard Di Natale it was OK — just look at the sacrifices people made during wartime. Was he joking? And how could he seriously argue that the prime reason for the load shedding was coal-fired electricity? It’s worth taking a look behind the scenes. Demand management (much beloved by Zibelman) was playing an active role as large businesses accepted financial bribes to use less power. The aluminium smelter in the west of the state was also being switched on and off — again, something for which compensation is paid. 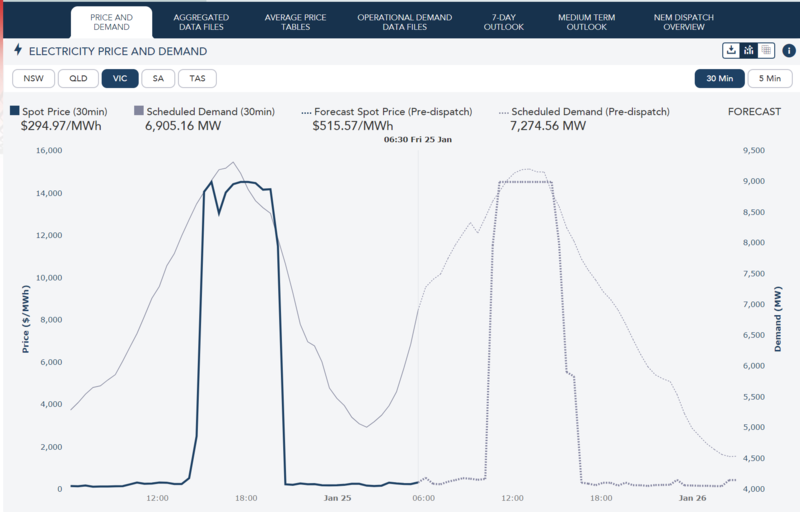 The spot price of electricity during this period was regularly peaking at the cap of more than $14,000 per megawatt hour. It had peaked at more than $60,000 in South Australia the previous day when an emergency was declared and reserves called up. One estimate puts the additional costs incurred last week at almost $1 billion, enough to fund at least one new high-efficiency, low-emissions coal-fired power station. These costs will be passed on to consumers in due course. What was the contribution of wind and solar during all this? Almost nothing. 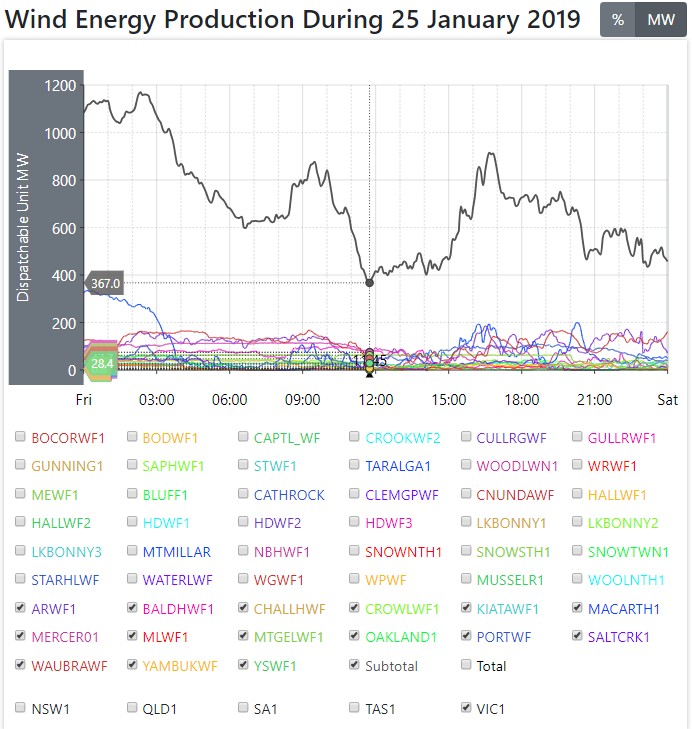 On Thursday, wind was contributing about 3 per cent to South Australia’s electricity supply and on Friday in Victoria, it was similarly low until the change. Solar was adding little. In any case, domestic systems generally won’t operate unless the customer has power from the grid. The ideal temperature for maximum output from solar is about 28C, with a significant loss of efficiency as the mercury rises. The problems with a number of dispatchable generators, including some brown coal-fired generators in the Latrobe Valley, were contributing to the shortfall of supply. But for D’Ambrosio to contend that the continuation of the Hazelwood plant would not have saved the state is laughable: the plant’s capacity was 1600 megawatts. It’s hardly surprising that a number of dispatchable power plants are prone to break down. With all the subsidies heading in the direction of intermittent renewable energy, there are inadequate financial incentives for the owners to keep them up to scratch. Last week demonstrated the unacceptable fragility of the grid to high temperatures. We had been told by AEMO that the reliability standards imposed on the system were such that we should expect an adverse outcome only once a century. It would seem that occasion arrived last week. On the face of it, this seems unlikely. Notwithstanding the massive investment in renewable energy over the past several years — $20bn was invested just last year — the effective addition to supply is much less than the quoted ­capacity figures. Indeed, the contribution of renewable energy in South Australia was so insignificant on Thursday that the bank of standby diesel generators was switched on, belching out emissions and ultimately costing a fortune for consumers. Mind you, were it not for those generators, it would have been very ugly in Adelaide as well. It’s clear what Zibelman — whose job must be hanging by a thread — has in mind to avoid this situation occurring again, and that could be soon. She wants to see hundreds of millions of dollars spent on new interconnectors between the states and a separate expensive capacity market established so she can have adequate reserves to call on when the supply-demand gap becomes tight. These capacity markets ­operate in a number of other countries but they don’t come cheap and they are vulnerable to ­manipulation by the participants. The bottom line is that the objective of affordable and reliable electricity is now further away than ever. The addition of subsidised renewable energy, even in the context of some battery backup, can’t produce reliable power but is likely to drive more dispatchable power sources out of the market before their effective expiry dates are reached. It’s why the federal government’s tender process to underwrite more dispatchable power entering the system is so important. But let me leave the last word to D’Ambrosio. The apologetic stance didn’t last long. Reverting to the party line, she told journalists late on Friday that “setting an ambitious renewable energy target (of 50 per cent by 2030) will boost jobs and investment across regional Victoria, as well as drive down power ­prices for Victorian businesses and families”. Curiously, she claimed that “wind power came through today (Friday) — it produced sufficient power generation”. That would be when the crisis was over. Someone really needs to tell her she’s just dreamin’ while she sits in her air-conditioned office. Judith Sloan wasn’t the only victim of Victoria’s self-inflicted renewable energy debacle to vent spleen. The owners of hundreds of hotels, restaurants, cafés, butchers, grocers and the like are also less than amused. 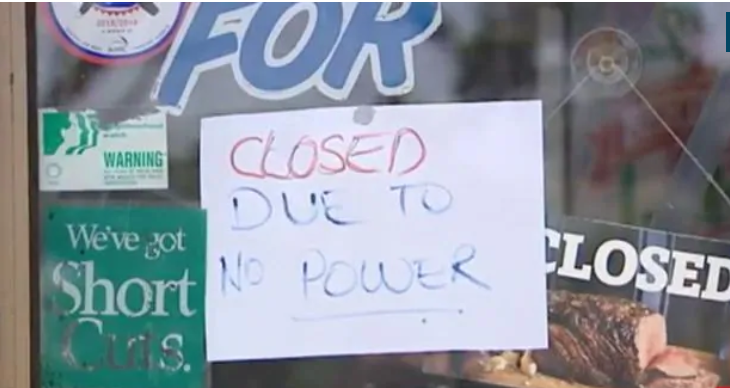 Melbourne business owners hit by last Friday’s blackouts want compensation for the income they lost when they were forced to shut their doors. More than 200,000 Victorian households and businesses had their power cut on a sweltering summer day after the Australian Energy Market Operator enforced rolling power outages to make up a 250 megawatt shortfall in supply. The AEMO informed the Andrews Labor government in November there would be a heightened risk of blackouts this summer. Jack Yeh, who owns Caulfield business Caffe Uffizi, was forced to close after the power was cut at 11.45am on Friday, costing him about half his daily earnings and forcing him to send seven staff members home. Cafe manager Alex Li, 26, said while he believed longer-term policy should aim for sustainability, at the end of the day he just wanted to be able to turn the lights on. Mr Li said the business could have lost $20,000 worth of stock if the blackout lasted longer than its 2½ hours. “I was very worried because I wasn’t sure what I was going to do with the cool room,” he said. He said his customers were left disappointed by the cafe’s closure. “Some people came that day and couldn’t get what they wanted,” he said. Melbourne ‘transitions’ to wind & solar ‘powered’ future. Wind and solar are failing because of intermittentcy without efficient storage. The result is fossil fuel backup is mandatory or there will be disastrous brownouts shutting down hospitals. This backup reality adds costs to retail electricity. South Australia has high investment in renewables and highest retail rates at 47 cents kph. Likewise the price of electricity in places that deployed significant quantities of renewables has increased dramatically. o	over 100 percent in Denmark since 1995 when it began deploying renewables (mostly wind) in earnest. I think all small business with refrigerated food need to invest in diesel generators as they cant rely on renewables. Very good setup for 20 k which would have cost mr li anyway. Even the macarthur windfarm has diesel backup for their control signal boxes. That is a blackout by any definition. The use of the brownout term in this case by people who should no better was misleading and deceitful. Brownouts come in two flavours: intentional and accidental. What was experienced here was an intentional blackout. Whether it rolled or not, I do not know. I recently noticed the misuse of the word ‘brownout’ creeping into the current situation in Australia. I assume the wreckers think ‘brown’ does not sound as bad as ‘black’. With ‘brown’ the power stays on, so I suppose the wreckers are right about that, up to a point. Deliberately calling a blackout ‘brown’ is a lie. A brownout is an intentional or unintentional drop in voltage in an electrical power supply system. Intentional brownouts are used for load reduction in an emergency. … The term brownout comes from the dimming experienced by incandescent lighting when the voltage sags. Thank you, I was concerned that the term ‘Brownout’ was being used – not only in Victoria but in SA as well, our power went off and apart from the excuse that the heat caused it – which I am unconvinced off – we had rolling ‘Blackouts’ as no power was available and a ‘Brownout’ would have meant we had power but things would have been operating very very weakly, such as the electric stove would have not cooked the cake in the recommended time. The Australian Electricity system is similar to a Mad Hatters Tea Party with all the loonies, morons and clowns wearing Top Hats running the disaster and telling Deluded Zombie Australians that all will be ok when the party is over and the Coal fired generators are all shut down.